These are the BEST Blueberry Muffins EVER!!! Made with whole wheat flour, these tender Whole Wheat Blueberry Muffins are naturally sweetened, dairy free, and prepared with a secret ingredient that amps up the blueberry flavor. If I had to choose one muffin to eat for the rest of my life, I would more than likely select blueberry muffins. But not just any blueberry muffin. It would have to be my recipe for Whole Wheat Blueberry Muffins, as they are the most tender, flavorful blueberry muffin I have ever had. Years ago, I accidentally stumbled upon the perfect combination for the best blueberry muffin ever. When I went to make some blueberry muffins for my kids, I realized I was completely out of milk and buttermilk. Out of desperation (and no desire to hit the store), I used grape juice in place of the dairy. The grape juice sweetens the muffins perfectly, while also keeping these whole wheat muffins tender and full of flavor. 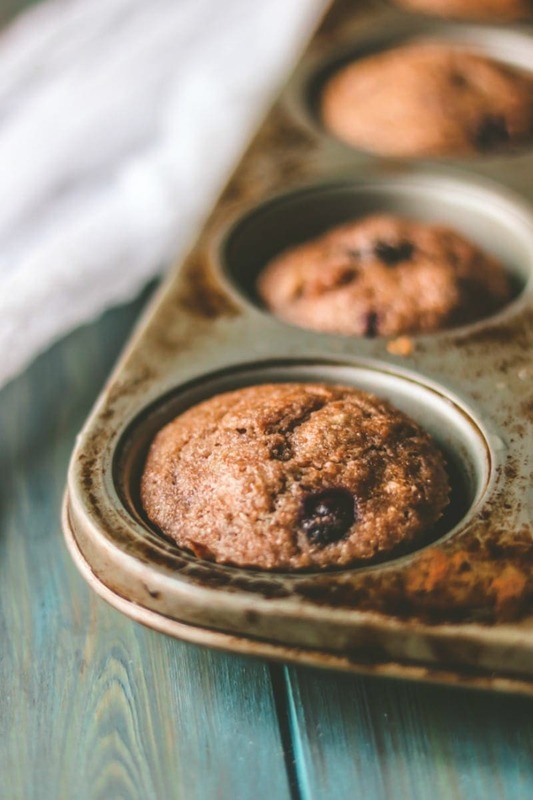 My blueberry muffin recipe is proof for any doubters in the crowd that whole wheat muffins can be as decadent as any gourmet bakery muffin out there! Prepare muffin tin by lining with muffin liners or greasing well. Add blueberries to dry ingredients and toss to coat blueberries in flour mixture. This helps the blueberries to not sink to the bottom of the muffins. In separate small mixing bowl, whisk together the eggs, juice, and melted coconut oil. Do not over mix, or your muffins may become dense and tough. Pour 1/4 cup blueberry muffin batter into each muffin liner. Bake until muffins are just set. Remove from oven and let cool in muffin tin for 10 minutes. Remove from muffin tin and allow to cool completely. Allow muffins to cool completely before placing in air tight container or bag. When baking with whole grain products, it is best to refrigerate or freeze whole wheat muffins, if not consuming within 2 days. You can use fresh or frozen blueberries. The frozen berries do not have to be defrosted, but note that they will bleed into the batter more, creating a “blue” tinge to the muffins. 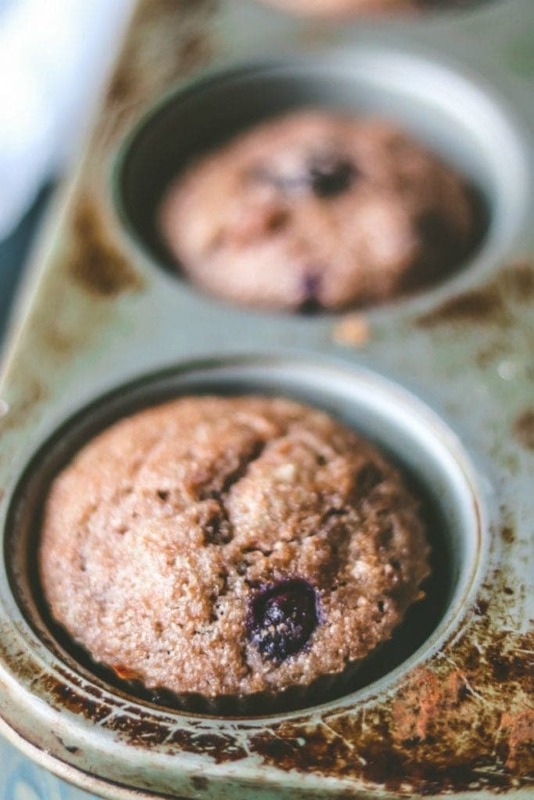 My favorite juice to use in these muffins is 100% grape juice. I use purple grape juice, but white grape juice or a grape blend will work as long as it is 100% fruit juice. Whole white wheat, ivory wheat, and whole wheat flour all work perfectly for these blueberry muffins. Even all purpose flour will work in this recipe. Be sure to just combine wet and dry ingredients until combined in your muffin batter. Over mixing the muffins, will cause for tough muffins. To make Gluten Free Blueberry Muffins: use an all-purpose gluten-free flour blend in place of whole wheat flour. To make Egg Free Blueberry Muffins: replace egg with 1 tablespoon ground flaxseed mixed with 3 tablespoons water. To make Vegan Blueberry Muffins: use maple syrup in place of honey and a flax egg in place of the egg. , they are worthy of some high praises as well. Heat oven to 400 degrees F and line a 12 cup muffin tin with muffin liners or grease well. In a large bowl whisk the flour, salt, and baking powder together. Take about 1 tablespoon of the dry ingredients and toss with the blueberries and set the berries aside. Add the blueberries and toss to coat with flour. Mix together the eggs, honey, vanilla, oil, and juice. Make a well in the center of the flour mixture and pour in the wet ingredients and combine. Do not overmix. Scoop about 1/4 cup of the batter into the prepared muffin tray. Bake for 15 minutes or until batter is set. Thanks so much for sharing your post at the Say G’day Saturday Linky Party. I’ve also pinned this recipe to the Say G’day board! Love healthy muffin recipes! Thanks for sharing! Well, you will love these muffins for sure, Gina! There look good! I need to go get some blueberries to put away for the winter, and a couple pounds (or ten) to eat. Thanks for linking this up at the Bloggers Brags Pinterest Party! I am with you. I love blueberries so much, sometimes I dont want to cook/bake with them because I just want to eat them!!! But with these muffins, it is worth the sacrifice. I am always on the look out for natural ways to sweeten my baked goods. I’d never thought to use fruit juice before. I’m having a “duh” moment and can’t wait to try it out myself! Thanks for sharing a yummy recipe! Well we all learn things from others. Glad I taught you a new trick:-) enjoy these…you won’t believe what the juice does to the muffins. Yum! We use coconut oil quite a bit for cooking too! Your muffins look delish! I think coconut oil take so many baked goods over the top!! What a hearty and satisfying treat!IMy husband would love to eat these muffins with his tea for breakfast! I can’t wait to make them. Thank you so much for sharing this healthy and delicious Blueberry Muffin recipe at the Healthy, Happy, Green and Natural Party Blog Hop. I’m pinning and tweeting this too! Awesome!! I absolutely love sitting down with a warm cup of tea (or coffee) and these muffins. Thanks for the share!!! First, I ran into one problem with Step 3 (mixing the oil, eggs, etc… ) Once the liquified oil came into contact with the cold eggs it immediately hardened into large clumps. I would suggest having the eggs room temperature before adding the coconut oil otherwise what starts out as liquid quickly hardens. I was able to melt it back down though. If I was rating these for myself I would give 1 star. I just didn’t think they were very tasty. They were moist, yes, but quite bland. Just lacking in flavor overall. I would not have made again. HOWEVER, my daughter (who is 8) absolutely loved them. And truthfully, I made them for her to begin with so that’s all that really matters. She took one bite, said it was good, then when she was done about an hour later came back for another one. Her exact words were, “oh my god, these are so good, I can’t stop eating them!” So a healthy muffin that my little one likes is A1 with me. It’s actually better this way, as I am not at all tempted to eat them! As far as being bland–I would disagree and side with your daughter, but I am completely use to eating muffins that have no added sugars, so that may be why. A typical muffin that you buy at the store or get at a bakery has so much added sugars and added blueberry flavoring–not real blueberries, so if that is what you have been eating as far as muffins, it would take a while to get used to the flavor. I hope you find some other recipes on my site that you enjoy and I am so glad your daughter likes them. Like you said, that is a win!! Oh, and one other thing that I forgot to mention, I would add in the recipe that these need to be refrigerated. I did not know that, and thinking they were kind of like other baked goods (cupcakes?) that I would normally put in the pantry in a tupperware, I did the same with these. I put them in a tupperware and in my pantry. In two days they were completely covered in mold. I mentioned it to my mom and she said I should have known better. Oh well, I didn’t, and that means others may not know either. I was a little upset to find all those ingredients and money wasted. So you may want to include that note with the recipe to prevent it from happening with anyone else. Gosh, I am so sorry! I would cry if something I made had mold on it. 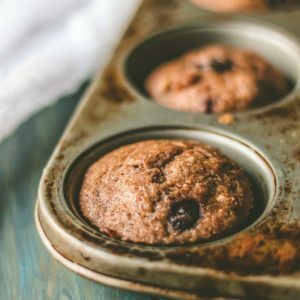 I have had these muffins stored in my pantry for longer than 2 days with no issues, but I noted for others to refrigerate or freeze within 2 days of baking, so that can be prevented for them as well. Typically, all whole wheat products or moist muffins (even with white flour) will become moldy if left out in warm environments. So for yourself, I would refrigerate all baked breads and muffins and rewarm when going to use them. That should prevent any future issues. Yes, I am definitely going to do that from now on! All baked goods that I make will be refrigerated from now on. They don’t contain preservatives so makes sense they won’t be able to be left at room temperature. I’m new to all this, live and learn! Making these muffins again today for my daughter. Woops! I must have used white grape juice the last time because this time I used the purple grape juice and they came out purple! Yikes! Note to self- use white grape juice next time! Is that what you used? The photo you included above isn’t accurate if you used blueberry grape juice. I too used that & like another reviewer stated the muffins didnt look at all like that- they were purple. I did in fact use blueberry grape juice. I wonder if the brand you used was stronger in color. My muffins certainly have a blue hue to them (maybe the pictures don’t show that realistically) but regardless, purple, blue, or brown–these are tasty in a natural way! Mine didn’t look at all like the photo either. They were a greyish purple color, and unlike the photo, the surface of mine were very smooth, not textured like the photo (I’d post a photo if I could). I’ve made these two times and both times they came out the same. Next time I will probably use white grape juice. The greyish purple color wasn’t very appetizing and I’m sure if that was the photo posted no one would want to make them. My daughter loved them the first time, but the second time she didn’t (kids- go figure). However, I am now trying to avoid sugar and after 2 weeks of not having any sugar whatsoever, these were a very tasty treat! Despite the unappetizing color I plan on making many more. I keep them in the freezer and when I’m ready to have one I just pop in the microwave for a few seconds. I wonder, can these be made with oat flour? You know I wonder if my muffins look different because I freshly grind my wheat berries–maybe they are darker in color…hmmm. Also, just lightly stir in berries. If you break them, they will bleed into the batter, changing the color. I will remake soon (I make all the time) and retake pictures to compare to original. I am sorry if they don’t look as appealing as they taste. And yes, once you get off sugar for awhile, natural foods taste tons sweeter 🙂 White grape juice will work perfectly. Oat flour will give you a completely different texture. I have peanut buttter and jelly oatmeal muffins on the blog that you could use as a base and put blueberries in the batter. These sound really good! My kids don’t love super sweet stuff…their grandmother, who does most of the baking around here, always uses either less sugar than the recipe calls for or natural sweeteners. These would be perfect for them! Just what I like to hear! So glad you enjoyed Aimee! These are such a healthy and delicious way to start the day! Perfect for those mornings when I have to eat on the go! And a healthier snack to grab for sure! Glad you liked these muffins Meagen!